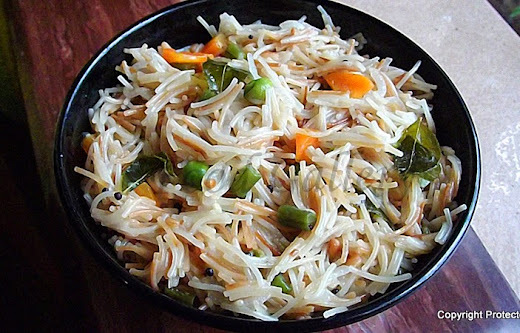 Upma is a very popular breakfast dish in South India. 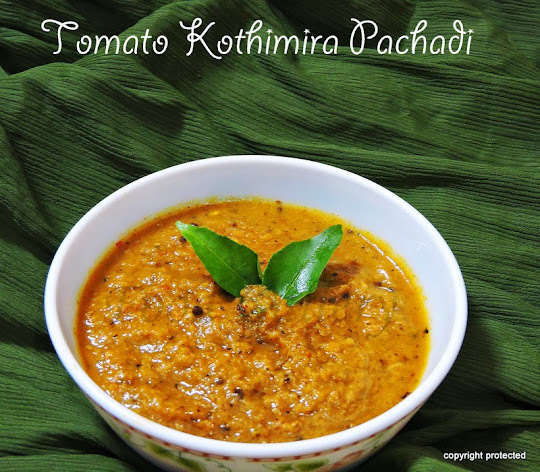 It is simple, easy and healthy one-dish meal which doesn't require any accompaniment. There are varieties of upma - Rava/semolina upma, mamidikaya semiya upma, semiya upma, rice sevai upma, etc., and all taste equally good. 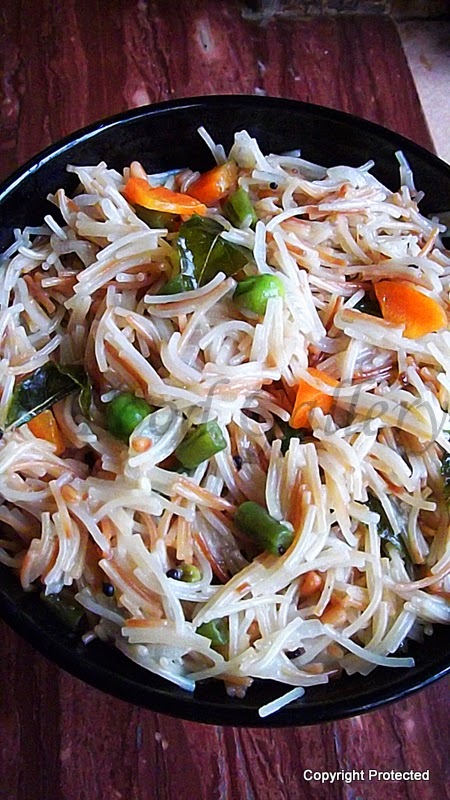 I have used vegetables to prepare this semiya upma, but you can prepare this without veggies. Heat 1 tsp oil in a kadai and dry roast the semiya/vermicelli on medium flame till it turns light brown and remove onto a plate. In the same kadai, add 1 tsp of oil and add mustard seeds. Once the mustard starts spluttering, add channa dal, urad dal and fry till the dal turn light brown. Add curry leaves, hing, onions, green chillies and fry them till the onions turn translucent. Add the veggies, salt and 2 cups of water and cover with a lid and let it cook on low flame. Check to see if the veggies are cooked, add the semiya and mix well and let it cook again on low flame for about 6-8 mins or till the semiya turns soft (see that it doesn't turn mushy). The semiya is now ready to serve. perfect breakfast and lunch box dish. love to see you at my space sometimes. Lovely flavor in the semiya upma which I have never made before. But surely a dish great for the start of the day or anytime is a good time. I really like your blog. I really appreciate the good quality of content and images…. !